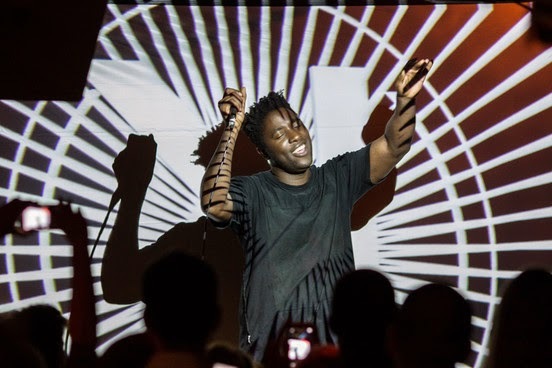 Last Monday I headed over to Hoxton for a live music gig by Bloc Party legend Kele. I have been pretty absent from blogging for the last couple of weeks as I have just moved into a lovely new flat in London so life has been pretty hectic trying to get everything organised. We moved in last weekend so I decided to make the most of my first week day night of not having to face the long commute home and went along to the event with my flatmate. The exclusive album launch party was held at The Macbeth and sponsored by Jack Daniels who have partnered up to create 'Jack Rocks The Macbeth'. The music campaign sees the venue holding a mixture of specially-curated live performances and stripped down acoustic sets from a number or performers from La Roux to Claire Barrow. The 150 year old live music pub holds up to 300 fans so each gig is very intimate and personal. Kele performed his new album 'Trick' to the 250 strong crowd with the album also being launched on the same day. I had a great night hearing some new music and drinking the special Jack Daniels cocktails all night, including my new favourite- Jack Honey and Lemonade. how fans can attend and get involved in the activities planned there.